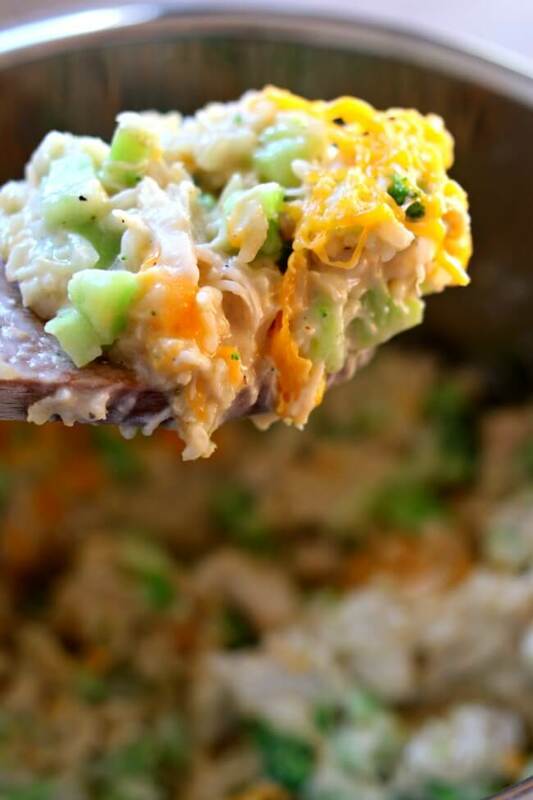 Instant Pot Cheesy Chicken Broccoli Rice Casserole–a lightened up, easy pressure cooker version of a favorite casserole. This version uses hearty brown rice and for the creaminess it uses greek yogurt instead of cream of chicken soup. The rice and chicken did not need to be pre-cooked. The oven recipe my mom used growing up called for cooked rice and cooked and cubed chicken. This is fine if you have it on hand but if you don’t have it ready it’s just another step and a pain in the booty. I didn’t have to use a can of cream of chicken soup but could still have a creamy casserole. I have nothing against cream of chicken soup but sometimes it’s nice to use ingredients that are less processed. Using just a bit of greek yogurt (that I make in the Instant Pot, by the way) produced the creaminess I was going for. Everything was finished and ready to eat within an hour. Thanks to the Instant Pot this is entirely possible. 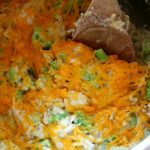 I think you’ll like this “casserole.” It’s kind of an all in one meal…veggies, starch and meat all in your Instant Pot. 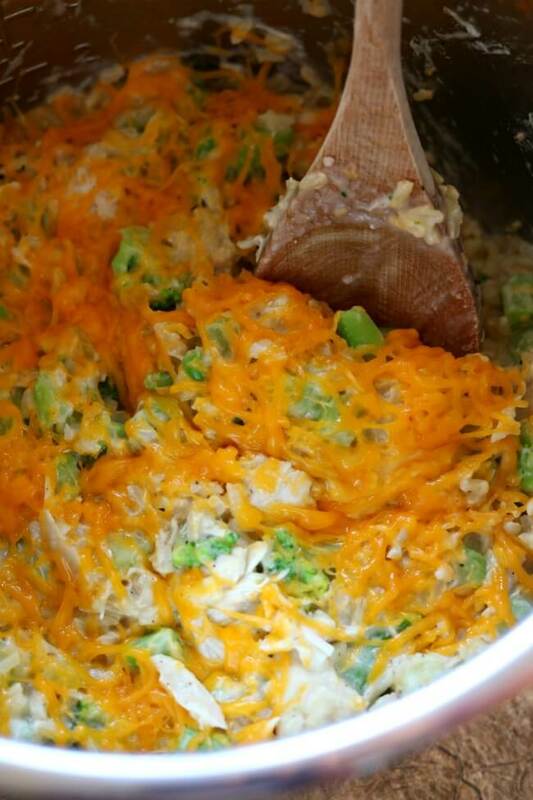 To make this Instant Pot Cheesy Chicken Broccoli Rice Casserole I used my 6 quart Instant Pot Duo 60 7 in 1 for this recipe. I also own the 6 quart Instant Pot IP-LUX60 V3 Programmable Electric Pressure Cooker. They are both great pressure cookers! The first one I mentioned has a yogurt making function but other than that they are fairly similar. The price difference between the two is about $20. Next time I get an Instant Pot I’m going to go for the 8 quart! Yes, I am a little crazy. A lightened up, easy pressure cooker version of a favorite casserole. This version uses brown rice and for the creaminess it uses greek yogurt instead of cream of chicken soup. Turn your Instant Pot to the saute function. Use the adjust button to turn the heat to the normal heat (the middle setting). Add butter to the pot. When the butter is melted add in the onion and saute for 3 minutes, stirring regularly. Add in the garlic cloves and saute for one additional minute. Add in the chicken broth, brown rice, salt and pepper. Stir. Nestle the chicken into the pot. Remove the lid and stir a bit. Use the spoon to break up the chicken into small bite size chunks. Place the contents of the broccoli package into a colander and run hot water over the broccoli. Add the broccoli into the Instant Pot and stir. Stir in the Greek yogurt. Taste test and add salt and pepper to taste. Sprinkle the cheese over the top and let it melt for a couple of minutes. Scoop the casserole onto plates and enjoy. Theres no instruction saying how to cook the broccoli only to run hot water over it.. that doesn’t cook brocolli. I assumed this would be a put everything in and then leave it alone. Having to steam.the broccoli separately and then do the instant pot chicken on it’s own makes for way more work. I am making this recipe tonite and I followed the suggestions for using the jasmine rice. 1 c rice and 1 cup ob chicken broth. Pressure for 5 mins. I started my pot and by the time it came up to pressure I got the burn notice. So I released the pressure and when I opened the lid I saw that all of the liquid was absorbed into the rice and it was sticking to the bottom. Put another cup and a half of water and restarted on 4 mins. Pressure is releasing now. Hoping that this can be saved. Not sure what happened. As an after note – once the dish was complete I stirred it without scraping the scorched rice off of the bottom. It was good. Reminded me of the baked chicken and rice casserole we all made in the 70’s. Clean up wasn’t as bad a I thought. I ran hot water in my pot right away and the stuck part came off. Thanks for the recipe. I enjoyed it. Can you use frozen cauliflower chuncks or rice? How would the time adgust? I don’t think so. The cauliflower would get mushy and good way to quickly compared to the chicken. You could cook it separately and stir it in with the chicken and broccoli later perhaps. WOW! This recipe is awesome. I am working a lot right now and my husband has been doing the cooking. He’s not necessarily comfortable trying new recipes but this one was well written to keep it simple. He did have to substitute soup for the yogurt but it turned out great. Thank you! We will be subscribing for more!! Hi… Can this recipe be made with Jasmine rice? Thank so much! Can’t wait to make it. To tell you the truth I don’t know because I’ve never tried it with jasmine rice before. However if I was to try it with jasmine rice I would cut the chicken broth amount to only 1 cup and use 1 cup of rinsed jasmine rice. Then I would use chicken breasts and cut them into bite size pieces before adding them to the pot. This will ensure that the chicken cooks at the same rate as the rice. I would then use a 4 minute pressure cooking time with a 5-10 minute NPR. Good luck! I don’t know if I’ll get a reply before I need to make this, but how would you make this recipe with frozen chicken breasts, white rice, and sour cream or cream of chicken soup? Thanks! Add in the chicken broth, white rice, salt and pepper. Stir. Add the cut up chicken into the pot. Remove the lid and stir a bit.Place the contents of the broccoli package into a colander and run hot water over the broccoli. Add the broccoli into the Instant Pot and stir. Stir in the sour cream. Taste test and add salt and pepper to taste. Sprinkle the cheese over the top and let it melt for a couple of minutes. I haven’t tried this version of the recipe yet so I’m not 100% sure how it’ll work. Let me know! Best insta pot recipe I have made so far! Made exactly as instructed and it was perfect. Really delicious. I have to admit, I had my doubts about breaking up the chicken with a spoon but it worked! Thanks for lightening up one of my favorite recipes. any tips for doubling recipe? Don’t know whether to cut back the broth and how much to increase cooking time………….. thanks!! My first “dinner” in my instant pot. But everyone LOVED it!!! My grandson said he could eat it everyday and he is the pickiest eater in the house. A hit and will be making this one often. Hooray! I love when picky kids eat food that’s good for them and easy to make! I’m so glad you liked it. I skipped the cheese, because I’m trying to keep calories down. And I *did* add a couple big heads of broccoli to the cooking stage, laying them on top of the chicken. They turned out very soft, but I actually loved it like that, so there was broccoli in ever bite. Thanks so much for saving me from cream of soup! Nice! Glad it worked well for you. Was the broccoli just fresh broccoli? Wanting to use white rice instead, but cooking time would only be about 8 minutes. My plan was to use frozen chicken thighs. What should I do? Also don’t have cream of chicken or Greek yogurt:( anything else I can use to substitute the two? The frozen chicken thighs won’t cook at the same rate as the white rice. You’ll have to cook the chicken first at least partially. Do you have sour cream? The flavor was good, but the rice was crunchy! What did I do wrong? Really? What kind of rice did you use? Did you use a regular measuring cup or the one that came with your IP? hat is preferred measuring cup? The one that came with the IP or a traditional measure cup? Can Jasmine rice be used instead of brown rice? I think you could. You’d have to adjust the cooking time for the rice. Also adjust the liquid amount. Check your instant pot manual for the rice to water ratio. Or go here to this chart: https://www.365daysofcrockpot.com/instant-pot-brown-rice-recipe/. Because jasmine rice doesn’t take very long to cook you’ll have to use chicken breasts (instead of thighs) and cut the chicken into cubes before cooking it. Love this recipe – fast, easy and healthy with the yogurt instead of cream or soup (I also cut down on the butter). i used sharp cheddar cheese and cooked the broccoli in the microwave. I made this with canned tuna and white long grain rice – 6 minutes HP with NR should be perfect. I am a new IP user and my guess for time with the substitutions was not quite enough, so will adjust to the above if I use white rice. I put it in the microwave for a few minutes and it was perfect. I am enjoying my IP, there sure is a lot to learn though. I love your crock pot cookbook, I got mine on Amazon. Hi Kat, thanks so much for sharing! There is a lot to learn but it’s a good type of learning. Thanks for supporting me and my blog. DO you think fresh broccoli would work and can the chicken be frozen? Read the comment before you to find out about the frozen chicken. Fresh broccoli might need to be quickly steamed in the microwave or on the stove before adding it in. I can’t seem to find the comment about frozen chicken. Can you use frozen chicken? yes you can! Same cooking time. My kids loved this dish. They don’t usually care for broccoli but with in mixed in they went for seconds! Its is going in our rotation of easy weeknight meals. Awesome!! So happy to hear this, Sara! You just run hot water over the frozen vegetables and add after the rest is cooked? I would prefer my vegetables to be cooked also, not thawed from frozen. Can this be added to IP with everything else before cooking? you *could. But the broccoli would be mushy mush by the time the chicken and rice is done. Another option would be to use a package of frozen broccoli that can be steamed in the microwave while you wait the 10 minutes for the NPR. Then you are ready to dump and go once the pressure is released. or you could leave the fresh broccoli in for another 10 min, that will probably soften it enough. or even steam the fresh broccoli in the microwave for 5-10, then add it in. I used fresh broccoli and steamed it in the microwave. It turned out great. I had 3 teenage boys over in addition to my own and they all loved it! Thank you so much! I did use cream of chicken soup instead of yogurt though. Nice Tammy! I love when that happens.